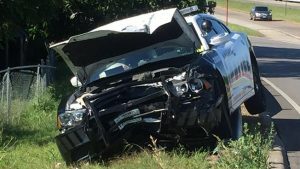 A Bristol, Va. police officer is at a local hospital after being hit on the way to an emergency call Thursday morning. It happened at the intersection of East Valley Drive and Old Abingon Hwy/Texas Avenue. the officer was responding to an emergency call with his lights and sirens on. the officer was traveling South on Old Abingdon Highway. As he crossed the intersection at East Valley Drive, a car traveling north on Texas turned left in front of the officer. Both the officer and the other driver were taken to Bristol Regional Medical Center for treatment. A sobriety blood test is being administered, per department policy. The cause of the crash is under investigation. No charges have been filed at this time.